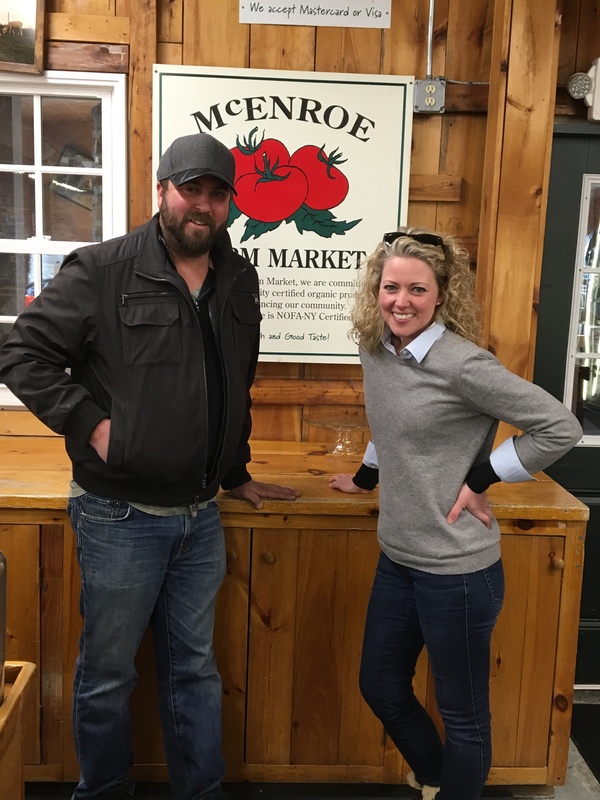 McEnroe Organic Farm specializes in Organics from the ground up. Organic Compost, Soil, Vegetables, Turkeys and Cattle. Beauty is more than something we see. Beauty is something that is within a person or place; a feeling that at times cannot be described. True beauty is experienced. A wonderful part of being married to The Butcher is the many new adventures that it brings! Our Market is closed on Mondays, but that usually means we are out having fun, meeting new people and learning new things. Many times our adventures take us Upstate New York… to the Mountains, to the Hudson Valley, to the Schoharie Valley. In the mountains of Upstate NY, the air is clean and the people are lovely. We always feel as though one day in the mountains can refresh us and then we can get back to work, back to our everyday. Our Market and our life are intertwined. Food… Good Food …is our business and our passion. Along the path to finding good food to bring to our special customers, we meet the best, most hardworking people who are responsible for the beginnings of that good food. Two Hours and Twenty Four Minutes drive from Huntington, Long Island took us on an adventure to a beautiful place in the Hudson Valley. A place where every day feels like two and we can feel unhurried and unstressed. This past Monday Adventure in the Mountains, turned into a Tuesday in which we spent the afternoon touring McEnroe Organic Farm in Millerton NY, The Hudson Valley. Now, just to be clear, a day or two of exploring in our happy place which allows us to feel unhurried and unstressed is the result of super hard work on the part of someone else. For The Farmer, living and working in this beautiful place requires many hours of intense labor and much education to be done properly, humanely and sustainably. Farming, just as Butchery, is an art form that is learned and built upon year after year. Farming is hard work requiring physical and mental strength, respect for the ground, the environment and the livestock. Art begins on the inside. An art is accomplished when the Artist is compelled by something. Farming comes from the inside. A Farmer is drawn to the land, completely encompassed by the lifestyle. As the younger generation becomes more in tune to where our food truly comes from, the Farmer and The Butcher become more and more valuable to us. The type of Farm to Table, that is attainable to most modern-day families, starts with The Farmer. From The Farmer, to the ground, to the vegetables, to the livestock and back to earth again. From The Farmer to The Butcher to The Market to Your Table. Our gracious host Erich McEnroe and his brother Wade have continued the family tradition and business of Organic Farming. Hard work, from the ground up, essential to our healthy existence. To me, this is beauty. McEroe Organic Farm began as a dairy farm in 1953, although their family had been farming in the Hudson Valley of NY since the 1870’s. In the 1980’s the McEnroe Family began transitioning the farm to organic farming practices with the goal of leaving the world a better place. The last of the dairy cows had been sold off by 1994 and Ray McEnroe began to raise organic Angus and Hereford beef cattle. By the year 2000 the farm began to diversify and started development of organic vegetable and compost production. The farm added poultry , pigs, and sheep. All livestock are humanely treated, pasture raised. No hormones, antibiotics or genetically modified seed are ever added to their feed. McEnroe Organic Farm has now been NOFA-NY Certified Organic for 25 years. It is one of New York’s oldest and most diverse certified organic farms with close to 1400 acres of fields, pastures, and greenhouses. At the McEnroe Farm, the animals are fed organic grasses and grains that have been grown on the farm. This is the definition of knowing where our food comes from! 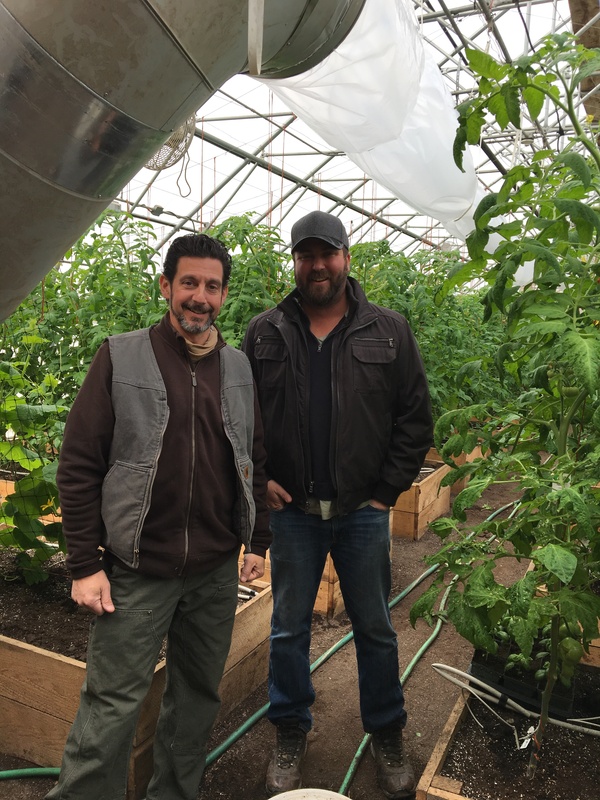 As Erich showed us around the farm, I could hear the pride in his voice as he spoke of his grandfather, his father and mother, his four brothers and the many transitions the farm has gone through over the years to sustain itself and adapt to changing needs. 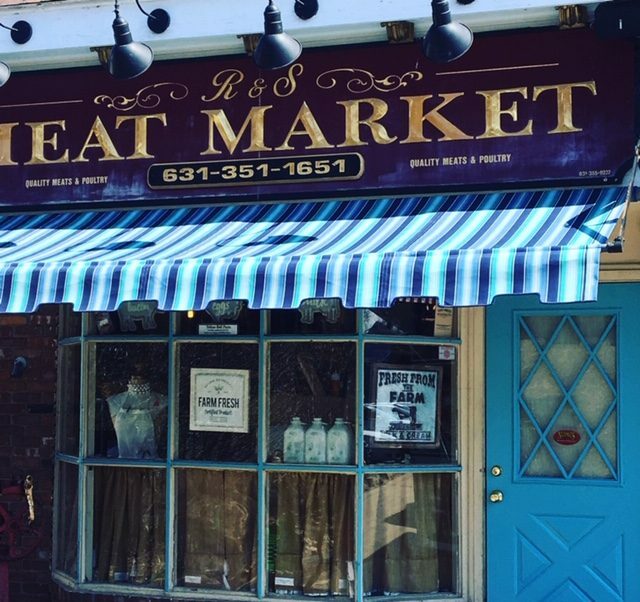 As Erich and his brother take the farm into a new direction with Organic Meats and Poultry, the family business will again turn another corner. Change is essential to growth. This is the life cycle. Anthony and I are always looking for the best quality products to bring to our family. We truly listen and wait to hear what our customers are asking for. Organic beef has been an underlying current amongst conversation with our special customers over the past year. At the farm, nothing is wasted. Manure from the cattle is composted along with carbon, straw and shavings. 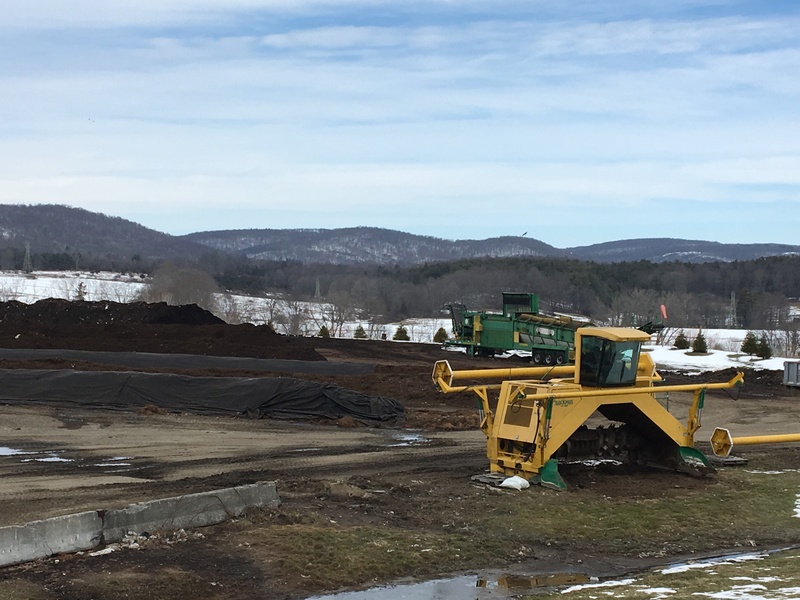 One aspect of the McEnroes Farm business is selling organic soil and compost to other farms and businesses throughout the New York and surrounding areas. This soil and compost is also used as fertilizer in the McEnroe greenhouses to grow their own organic vegetables. Many of the vegetables grown at the farm are sold at markets throughout New York. Tomatoes, cucumbers and veggies that aren’t sold are turned into organic salsa’s, pickles, sauces, ketchup, and juices. 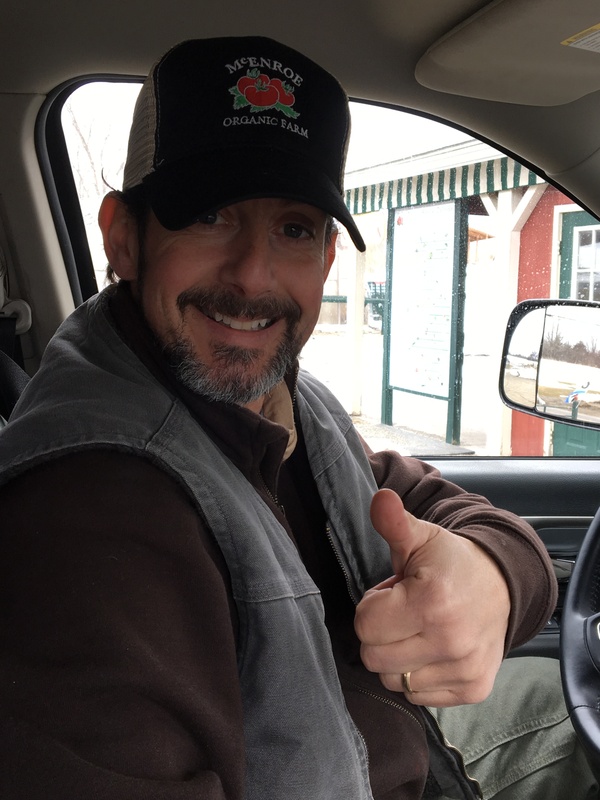 Not only did Erich take us on an in-depth tour of the many facets of the farm, but he treated us to a delicious Organic turkey lunch complete with organic greens from their winter greenhouses! All prepared at the farms beautiful roadside Market. McEnroe Market prepares a selection of local, seasonal and organic dishes daily. All of the food waste is composted! I’m impressed! The Butcher and I look forward to seeing where our new adventures with the McEnroe Organic Farm Family will take us. Follow along as we continue to learn new things and bring the best of everything to you! 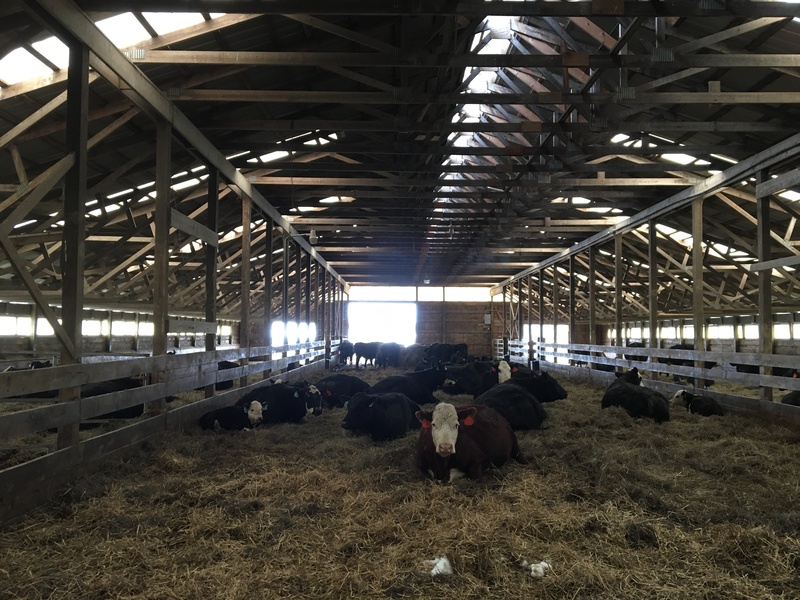 All of the cattle and livestock at McEnroe Farm are humanely raised . The Butcher is up to New Adventures! And I brought home a souvenir! It looks like I will be roasting an organic Turkey soon! The Butcher brought home souvenirs too! Are you planting a garden this spring? Look for the beautiful Organic McEnroe Soil at our Market.